How many more hours could you use in a day? What would you use the extra time for? Students in secondary school to students in university are looking for useful tips on how to study for exams. Today’s tip that we will cover will be on Time Management Techniques. When a person learns to manage their time efficiently they will become more effective at what they are trying to do. For the student this means using their time properly when studying for exams. Trying to study for an exam the night before is not a good time management technique and may sometimes result in failure. As mention earlier when you manage your time more efficiently you become better at the task you are undertaking. You also do not lose valuable time when working or studying. You also will meet deadlines. This is more applicable when you are out in the workforce but as a student organizing your time better allows you to finish up projects on time with time to spare. By being more prepared you could actually save yourself extra work and do a much better job. Have you ever noticed when you are rushing to finish something things tend to go wrong. If you are cramming for an exam you usually lose your focus on exactly what you should be studying. This could have a unwanted result on your exam results. As you learn to master these time management techniques over time you will actually start to feel better since you have alleviated some of the stress in your life. Hard to believe that just by following some tips on how to study for exams you can achieve better health. So we know that by applying best time management techniques to manage our time better it is definitely going to help us with our studies and it will also help with other aspects of our life. But what can we do to actually manage out time? What are the best techniques of time management you can apply for good grades? One of the first things you can do is be honest with yourself. You know what you can really accomplish so when scheduling tasks do not overload yourself. It is better to have some time left over than not have enough time to finish the tasks at hand. By following these simple time management techniques you will be dealing with a lot less stress. 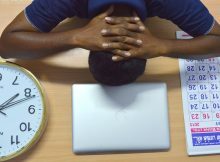 When you are faced with a large task follow these time management techniques for students and break that task down into small manageable tasks. Then work on each of the small task and before you know it that large task will be completed. When breaking down the large task make sure to include everything that needs to be done no matter how small. As you get into the habit of managing your time when doing tasks take note as to when or where you are wasting your time. Make note of what is distracting you. If you can eliminate the distractions you will remain focused and will be able to get the task done on time. This is just one of my many great tips on how to study for exams that can be found in the Good Grades Guide. Time is the one asset that you, your peers, and your lecturers all have the same amount of each day. Waste that asset, and you will suffer. Manage it wisely, and you will reap the rewards. The choice is up to you.